In 2009, Hemsworth portrayed James T. Kirk's father, George Kirk, in the opening scenes of J. J. Abrams' film Star Trek. He played the character Kale in the thriller A Perfect Getaway the same year. He went on to play Sam in 2010's Ca$h, which was the first film he shot when he arrived in the United States. The film's director, Stephen Milburn Anderson, said Hemsworth had only been in the United States for six weeks when he had auditioned for the role, recalling, "Here's a guy who is young, has the right look, is a very good actor and, let's face it, he's beautiful. So I say, we need to get this guy in. I was very impressed". In November 2010, The Hollywood Reporter named Hemsworth as one of the young male actors who are "pushing – or being pushed" onto the Hollywood "A-List". 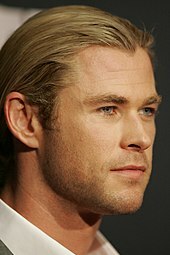 Sony Pictures announced in 2011 that Hemsworth would star in the thriller Shadow Runner, which did not subsequently go into production as of 2014[update]. ^ Vejvoda, Jim (29 August 2013). "James Spader to Play Ultron in the Avengers Sequel". IGN. Archived from the original on 2013-08-31. Retrieved 29 August 2013.